Certainly those who experienced war or were abused or neglected as a child have undergone a life-changing trauma. But even if you were lucky enough to avoid these severe experiences, don’t think that trauma hasn’t affected you. Trauma is one of the most widely recognized external sources of emotional difficulty, especially following the Adverse Childhood Experiences Study (ACES) in the mid-1990s. In this landmark epidemiological research study, the Kaiser Permanente health maintenance organization, along with the Centers for Disease Control and Prevention, surveyed 17,000 adult healthcare patients. They were asked 10 questions about their childhood experiences with physical abuse, sexual abuse, emotional abuse, physical neglect, emotional neglect, whether their mother was treated violently, household substance abuse, household mental illness, parental separation or divorce, or if a household member had been incarcerated. The ACES study found that 1 in 11 middle-class adults had experienced 6 or more of these events, an exposure level far higher than had been anticipated. And of those who had 6 or more events, the resulting emotional, behavioral, and health consequences were staggering. These traumatized people were 4,600 percent more likely to become IV drug users. They were 30 times more likely to attempt suicide. Not only was their emotional functioning fragile, but their physical health was far more likely to involve chronic disease states largely as a result of high-risk behaviors, such as smoking, drug use, promiscuity, and over-eating. Stressed out people tend to adopt coping mechanisms, such as addictions or unhealthy emotional states, to manage their emotions. During follow-up longitudinal studies, highly traumatized study participants were found to have had a life expectancy that was 20 years shorter than those who had not experienced such high levels of trauma. The unrelieved stress of living with the emotional damage of trauma causes chronic effects on the central nervous system, releasing pro-inflammatory biochemicals and suppressing the immune system. Fearful responses learned in childhood are especially powerful, because they couple the sense of terror with a sense of helplessness, leading a child to believe he or she is unable to respond to frightening situations. This sense of powerlessness can continue into adulthood, resulting in depression, anxiety and panic attacks. They may then learn to be very self-blaming, perfectionistic and self-critical as a way of trying to earn that approval. These internal negative thoughts about the self can trigger the fear response in the brain and body. So self-rejection can lead to the same response in our body and brain as the fear of being stalked by a tiger! Developmental traumas are more damaging than random events, such as crimes or hurricanes, because this trauma is personal — someone (often a family member) chose to hurt you. Someone who should be providing security and comfort is instead harming you. This produces strong emotions of fear, but also shame, in the context of feeling psychologically alone and helpless. Feeling invisible while in great distress is what is so deeply hurtful. In contrast, strong attachment bonds signal that someone will be there for us when we are in distress and will provide emotional healing. The most common cause of chronic trauma is a negative parenting style, such as parents who are harsh, judgmental, verbally abusive, permissive, anxious, easily agitated, overly focused on behaviors, or under-focused on responding to a child’s emotional states. a child is helpless in the face of threat because of the natural dependency on parents. “Imagine a child’s parent is often angry and calls them stupid. The child experiences the parent as threatening and dangerous, there will be arousal of panic/fearful emotions within the child, and these emotions will be associated with the words the parent uses (e.g. ‘stupid’). Note too that the child cannot just run away or escape, so in that moment the child may feel trapped and that no one will rescue them. Another key emotion that follows on from the sense of ‘no rescue’ is feeling very alone. Fear, a sense of entrapment and aloneness are all emotional experiences being programmed into the child’s brain. If this happens repeatedly that programming will become more fixed. Harshly critical parents who over-focus on behavioral compliance often try to gain a child’s compliance with the use of judgment or shame, or with threats of abandonment or rejection. A child learns to judge, criticize, and essentially reject herself in an attempt to find acceptance and love. In terms of self-acceptance, the problem with rejecting, unemotional or neglectful parenting is simply this: If parents are not nice to you, how do you learn to be nice to yourself? And if you cannot be nice to yourself, how do you learn to be nice to others? How do you learn to trust that others can be nice to you? How do you learn to trust that you can be nice to yourself? Essentially the entire social world may appear to be an emotionally threatening place — even the relationship you have with yourself. And if developmental trauma teaches a child that even his own emotions are threatening, he learns to shut down to his physical, emotional and intuitive experiences. He learns to over-think, leading to worry and stress. And he learns to under-feel, leading to an inability to generate pro-social emotions for himself or others. This pattern is most notable clinically in couples and families, because a clinician can witness the lack of kindness between members. Most couples and families appear for therapy with relationship issues because they do not behave generously, thoughtfully and compassionately toward others. Some even express outright that they do not have an ability to experience feelings for others. I would suggest this is a major indicator that they also lack these skills in relation to themselves. A lack of compassion toward others is a major indicator of lack of self-compassion. Inability to recognize emotional states in others indicates a lack of this ability toward oneself as well. The source of this lack of pro-social skills is often parents who failed to provide appropriate emotional attunement and responsiveness, especially during the key attachment period of ages birth to three. There is also the unfortunate conundrum trauma survivors face: They find it difficult to connect to others, since physical and emotional closeness triggers a sense of danger. Yet common sense and research tell us that feeling loved and connected to other supportive family and friends helps heal trauma. Read more on Bessel van der Kolk’s writings. 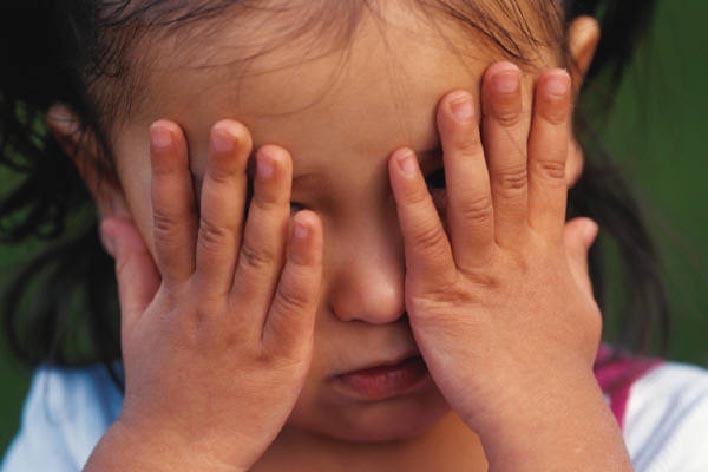 Stressful experiences in childhood sensitize the brain and nervous system to threats. Traumatized individuals learn to “live in the limbic system,” or emotional brain, and do not learn to engage the cortex to manage emotions, such as fear. They lack the ability to be calm or stay calm. Essentially, their set-point for anxiety is set too high. The hyper-aroused brain is then more easily hijacked by the threat response, even in adulthood, when an experience may be interpreted as more stressful than it really is. Because children developmentally lack the cognitive capacity and experience to manage strong emotions, childhood trauma victims learn patterns of emotional over-reactivity to threat. This response is a normal, self-protective response by a child whose cortex is not fully developed, is in an acute or chronic fear-provoking situation, and lacks adult support to care for his or her emotional state. Threats of social or emotional rejection or abandonment will appear especially fear provoking. Traumas that involve lack of attachment to caregivers, shame-based parenting, or neglect are especially likely to lead to a sense of low self-worth and shame. Neglect and abuse victims believe that if parents did not protect them from or even caused abuse, then the child is not worthy of love and acceptance. If we consider the threat response, it is clear that a person who is in “fight-or-flight” on a continual basis is going to have more difficulty regulating emotions. He will react more impulsively with fear responses, including “fighting” with anger or aggression, or will merely be nervous and upset. Fear also makes it difficult to concentrate due to hyper-vigilance. For many people, trauma is a shameful experience that leads to self-blaming beliefs that the incident was the victim’s fault. Negative self-image also is a way to attempt to protect oneself from further harm or blame. Quite simply, trauma turns up the volume on many normal, adaptive human cognitive processes, emotions, and behaviors. Even lack of self-acceptance can be traced to trauma. Trauma and attachment trauma sensitizes our natural human alarm system that signals social exclusion. Those who have been harmed, neglected or rejected by others will be especially attuned for that rejection in the future.